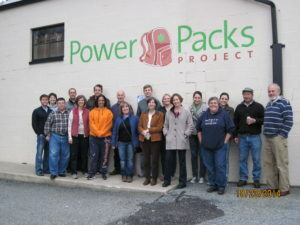 GKH attorneys and staff recently spent several hours at the Power Packs Project warehouse in Lancaster city, learning about this exciting program and helping to inventory mountains of food items. Twenty GKH employees, notebooks, pens and smart phones in hand, paired up to count cans of soup and salsa, boxes of cereal, and packages of pasta. When the counting was done and the totals were checked and double-checked, the group enjoyed a presentation by executive director Kim McDevitt, before ending the evening with pizza. Each year GKH is committed to working together with one of Lancaster County’s many human services organizations. This was the first time to volunteer with the Power Packs Project, which helps provide food security for families over the weekend when school is not in session. To see more photos of the GKH team at work, visit us on Facebook.